He allegedly shoved a man onto subway tracks. Police are looking for a man wearing a "Make America Great Again" hat and shirt who allegedly shouted racial comments at another man and then pushed him onto the subway tracks Friday night. The suspect got into a verbal fight with a 24-year-old man at around 8 p.m. Friday while on a northbound 4 train approaching Union Square Station. Police say the suspect made derogatory statements about the Latino victim's ethnicity in the course of the fight. Specifically, he is thought to have accused "Mexicans" of coming to the country to bring drugs and take jobs. The two men got off the train at 14th Street, where the suspect punched the other man repeatedly before shoving him onto the subway tracks and fleeing to the L train platform, police said. The victim's friend and a bystander helped him off the tracks; he was treated at a hospital for a head laceration. 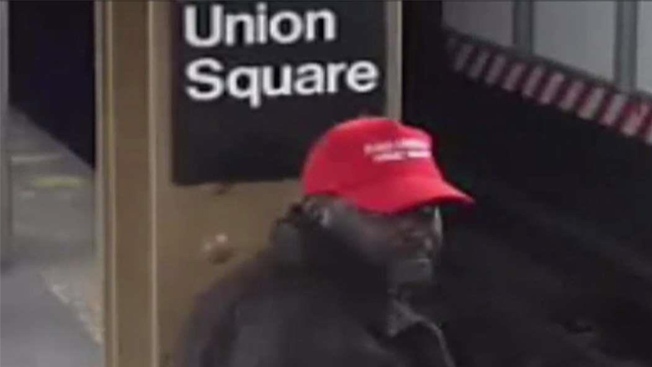 The NYPD described the suspect as a heavyset black man in blue overalls with a red hat and shirt displaying the slogan first popularized by President Donald Trump on the campaign trail.